North Carolina has become a hotbed for solar power development, with a recent project being one of the largest solar projects in the eastern part of the state—the 1.3 MW rooftop project by ESA Renewables for Duke Energy Progress. North Carolina has recently become a hotbed of solar development, thanks in part to a combination of federal and state tax incentives, as well as state property tax abatement. "What makes North Carolina so attractive is they have utility-based programs," said Lindsay Herold, contract administrator for ESA Renewables based in Lake Mary, Florida. But using state tax credits on a project isn't as easy as it sounds, and solar developers need to team with a state-based company with a big tax appetite, such as a bank, she said. Thanks to previous experience developing photovoltaic projects in North Carolina, ESA Renewables was able to take advantage of the tax incentives when it developed a 1.3 megawatt PV project in New Bern, North Carolina. When it came on line, the roof-mount system was one of the largest rooftop installations in eastern North Carolina. Herold said ESA Renewables hoped this type of project would spur others in North Carolina to embrace two existing resources—a hefty number of sunny days annually and ample large rooftops. "My belief is that rooftop applications are ideal, especially for people who own large warehouse buildings and rooftops that are appropriate for solar," she said. The roofs not only offer a perfect base for solar, they can also provide the building owner with another revenue source. "After all, what else would you do with that rooftop," Herold said. The New Bern project actually dates back to 2009, when Advanced Green Technologies (AGT) began work on it. ESA Renewables acquired the project in mid-2010 before any construction had begun. The company began negotiating a power purchase agreement with Progress Energy Carolinas, a subsidiary of Duke Energy (based in Charlotte, North Carolina). Progress Energy Carolinas changed its name to Duke Energy Progress in April to avoid customer confusion. 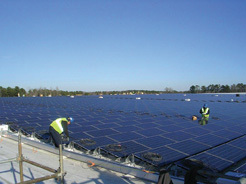 By the end of 2010, ESA Renewables was able to obtain a 20-year contract from Progress Energy Carolinas that included a set rate along with an escalator. The utility retained the solar renewable energy credits, while ESA Renewables was to build, operate, and maintain the system. Under the agreement, ESA Renewables was also to install its proprietary monitoring system to monitor operation of the array for the life of the PPA contract. Herold said the New Bern project was grandfathered in under Progress Energy Carolinas' legacy type of PPA, which is no longer available and was replaced with the SunSense program (which was cancelled in 2012 and will not reopen until later this year). In the meantime, Progress Energy Carolinas offered a standard option program for owners of PV systems less than 5 MW who wanted to sell energy to the utility. Sellers can choose fixed-rate contracts for five, 10, or 15 years. 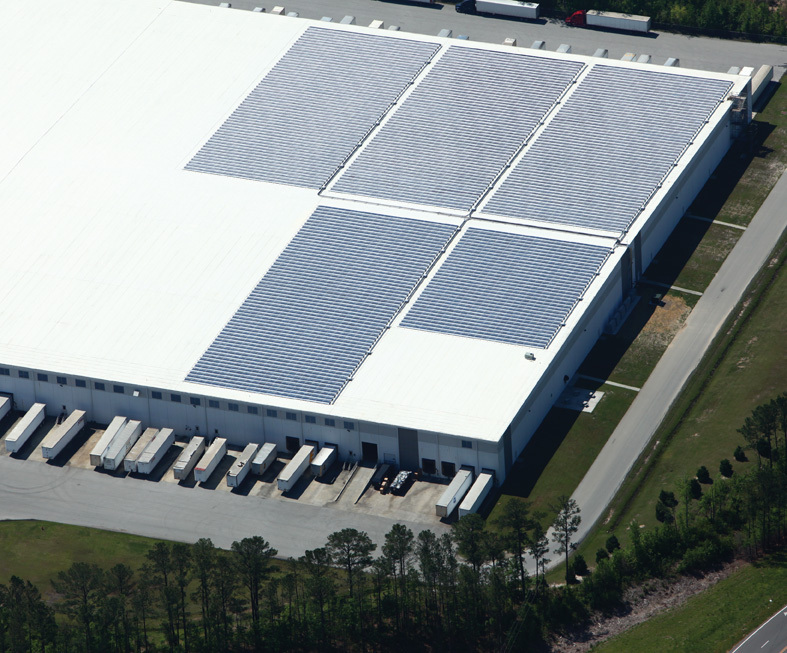 A total of 5,376 235-watt poly-crystalline modules were used in the New Bern project. ESA Renewables selected PV-powered 260kW commercial inverters from Advanced Energy of Fort Collins, Colorado, for the project. The New Bern project is the seventh large-scale solar PV project associated with Progress Energy Carolinas and is the result of the company's 2008 request for renewable energy proposals. It brings the total amount of solar-generated power currently purchased by the utility to more than 10 megawatts. The New Bern project, as well as other similar projects, will help Duke Energy and its utilities meet the requirements of North Carolina's renewable energy and energy efficiency portfolio standard. The regulation establishes minimum amounts of energy from renewable sources or gained through energy efficiency that each public utility in the state must meet. They can be gained through construction or purchase of renewable energy generation facilities or through PPAs, said Jeff Brooks, a Duke Energy spokesman. By the end of 2012, the standard was three percent of 2011 North Carolina retail power sales, according to the portfolio standard. By the end of 2015, that amount jumps to six percent of 2014 North Carolina retail sales. And by 2021, the minimum climbs to 12.5 percent of 2020 North Carolina retail sales. The portfolio standards also set the minimum amount of solar-generated electricity that must be included. In 2012, that amount was 0.07 percent. In 2015, that doubles to 0.14 percent. Both Duke and Progress Energy Carolinas met the 2012 milestone and are on course to meet the 2015 goal years ahead of schedule, Brooks said. North Carolina is a magnet for solar developers, in part because of state tax incentives, said ESA Renewables' Herold. The federal government offers a 30 percent tax credit, and North Carolina offers an additional 35 percent, up to $2.5 million. "So a lot of people find North Carolina really attractive because of that additional tax credit," she said. On top of that, the state offers an 80 percent property tax abatement on labor and materials "which helps a project's finances tremendously." "But the key to really making this work for the tax credit is you have to have someone who has North Carolina tax liability to absorb those credits," she said. "We had done some additional projects before this one, so we had worked with other state tax investors. We understood the financial model, and we could make the project work. That's why it was a bit easier for us than someone else to duplicate the model. "Sometimes what's difficult is to get a typical business to understand the financial model." ESA Renewables searched the region to find the right rooftop on which to build the PV system, then sized the project to fit. The winning candidate was a large warehouse that housed BSH Home Appliances Corp.—a wholly owned subsidiary of BSH Bosch und Siemens Hausgeräte GmbH, headquartered in Munich, Germany—which manufactures appliances. The warehouse roof was also desirable because it didn't need reroofing or major alterations, Herold said. The only modifications needed were penetrations to accommodate the PV racking system and to ensure it met wind load and building code requirements. Altogether, the project occupies 175,122 square feet—a good portion but not the complete rooftop. Securing the necessary city construction approvals was relatively easy and involved obtaining basic building and electrical permits, Herold said. Knowing the roof structure influenced the choice of panels and racking, with ESA Renewables going with Canadian Solar's Zep-compatible PV modules and Zep Solar's patented Zep System III mounting and grounding technology. Although Canadian Solar was founded in the Canadian province of Ontario, ESA Renewables worked with Canadian Solar Inc., its U.S. subsidiary. Altogether 5,376 Canadian Solar 235-watt poly-crystalline modules were used in the project. Zep mounting and grounding hardware from the San Rafael, California, manufacturer, as well as other accessories, mate with the Zep groove incorporated into compatible PV modules, reducing system costs while simplifying and speeding installation. ESA Renewables also selected PV-powered 260kW commercial inverters from Advanced Energy of Fort Collins, Colorado. Herold said her firm first and foremost favors these inverters because of their quality and AE's great customer service. An added attraction is that ESA Renewables is factory certified to service and perform maintenance on the inverters. Rather than wait for an authorized maintenance technician, ESA Renewables technicians can open the inverters and service them. "It saves investors and other third parties a lot of headaches," Herold said. Typically, if you open an inverter and are not factory authorized to perform maintenance, you invalidate any warranty. As it has so often in the past, ESA Renewables brought in supervisors to oversee the New Bern project and hired local laborers to help with the actual installation. ESA Renewables searched the region to find the right rooftop on which to build the PV system, then sized the project to fit, at 1.3 MW. The winning candidate was a large warehouse that housed BSH Home Appliances Corp. The warehouse roof was desirable because it didn’t need reroofing or major alterations. With the economy being hit hard in New Bern, Herold said it wasn't difficult to find people with the necessary skills who wanted to work. Flint, Michigan-based Newkirk Electric Associates, which has an office in Raleigh, N.C., was the electrical contractor in charge of major electrical work and hooking the PV project into nearby power lines. "We like to build in the local economy as much as we can," Herold said. "We typically like to hire local labor, and then you get community support for the project as well." According to Herold, construction went relatively smoothly and the only major challenge was working around the security issues. The warehouse is surrounded with a security fence, and the guard must open the gate to let visitors and supply trucks in and out during business hours. But materials delivery and construction crews didn't necessarily work business hours. "We had a challenge working late or working on the weekends, because there was no security guard to let us in or out," Herold said. So they had to coordinate their work schedules with the building owner. Herold said. This project is expected to produce 1,691,639 kilowatt-hours of electricity per year.